No presenter's language at the ANA Masters of Marketing Conference was as disruptive as P&G's Marc Pritchard's, says the CEO of TBWA\Chiat\Day New York. As I was down in Orlando, Fla., at the Association of National Advertisers' Masters of Marketing, this very publication was putting the finishing touches on an article touting the historic lows of agency morale (down 36% from last year for those keeping score). Well, I'm pleased to tell you that there was a ray of hope to reverse this trend down in Orlando and it came from the man from Cincinnati. Mark Pritchard. The global CMO of the world's biggest advertiser, P&G. As I was sitting in the convention hall amidst some 2,700 clients and some agency folk, I was stunned and delighted to hear Mark say, "The last few years have been admittedly tough on agencies ... and it's time to turn the page. The negative narrative needs to stop." Indeed, I heard and saw a number of good presentations from clients like McDonald's, CVS\Health and American Greetings—each of them calling out their agency partners. Still, no presenter's language was as disruptive as Mr. Pritchard's. It began with a simple but powerful slide. 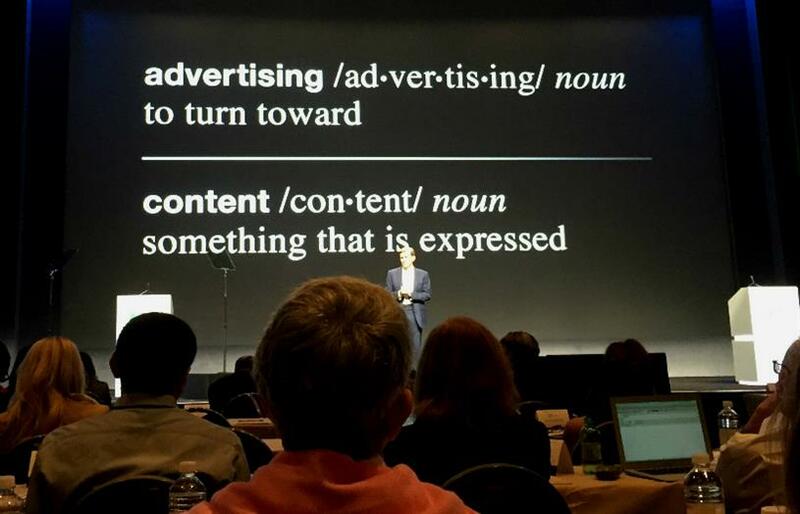 It featured the dictionary definition of "advertising," which states "to turn toward." And the definition of "content," which is about "something that is expressed." In this world of clutter, fragmentation and attention deficit, brands need to give people a reason to turn toward them. In other words, advertising. And who better to do this than the professional storytellers of Madison Avenue. As Pritchard said, "Our agencies are good people, the ones who do good work to create magic together will all of us." It was a large dose of humanity, empathy and warmth in an industry that has been obsessed with harder, angrier and colder stuff like measurement, procurement, media mistrust and technology. Sure, I run an ad agency, so this is exactly what I want to hear. But what I thought was even more powerful was Pritchard's case for agency value—which in a word is creativity. He made this abundantly clear with creative examples from brands like Always and Gillette. And summarized it nicely with the title of his presentation: "Raise The Creative Bar." Now, I wouldn't be so enthusiastic if this agency love came from a niche brand. But this came from P&G. This came from a company that spends billions on advertising. This came from the man who a few months ago was admonishing agencies that "[their] complexity is not [the client's] problem." So, while agency morale may be the lowest it's ever been, maybe, just maybe, things are starting to look up. Part 2: Can you buy good content from a creative agency?